Married couple jailed under laws that call for death or life in prison. 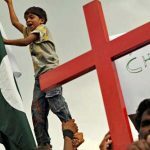 LAHORE, Pakistan (Morning Star News) – A Christian couple was arrested on Saturday (July 20) for allegedly sending blasphemous text messages to a Muslim cleric in Gojra, a religiously volatile city where a week before a young Christian man was sentenced to life in prison on the same charge. Shafqat Masih, 43, and his 40-year-old wife Shagufta, who reportedly have four children between the ages of 5 and 11, were taken into custody on a complaint by Muslim cleric Rana Muhammad Ejaz, who alleged that he had received blasphemous text messages from Masih from a number registered in the name of Shagufta. Gojra City police registered a case under Section 295-C of Pakistan’s widely condemned blasphemy laws for allegedly defaming Islam’s prophet, Muhammad. Conviction is punishable by death or life in prison, which is 25 years in Pakistan. Saying police coerced him into recording a false admission of guilt, Masih has denied sending the text messages, according to an official at a Christian rights organization who requested anonymity. The official said two lawyers representing his organization had met with Shafqat. “The case is quite complex,” he said. 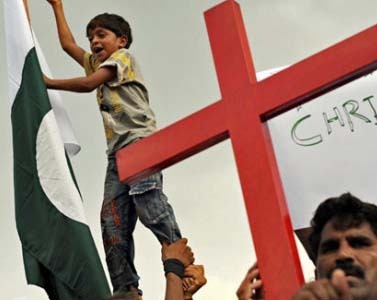 The accusation is the third known incident in Pakistan of Christians charged for allegedly sending blasphemous content via cell phones. The first was registered in Karachi against Qamar David, who was allegedly killed in Karachi Central Prison in 2011 (official cause of death was heart attack). In the second case, 29-year-old Sajjad Masih was sentenced to life imprisonment and fined 200,000 rupees (US$1,980) in Gojra on July 13 (see Morning Star News, July 15). Accusations of blasphemous text message could be a dangerous trend, as obtaining and activating SIM cards on someone else’s national identity card is not difficult in Pakistan. Such evidence is hard to challenge in court, leaving people of all faiths at risk of being falsely convicted of blasphemy. Gojra City Police Chief Inspector Muhammad Nisar told Morning Star News by phone that police had verified that the SIM used to send the blasphemous text messages was registered in Shagufta’s name. “Her husband has admitted to using the SIM in his phone to send the messages to Ejaz,” said Nisar. Shagufta works at St. John’s School in Gojra as a maid, and her husband is a night watchman at the campus. There was no immediate word on who was caring for their children; the couples’ relatives have reportedly fled the area in fear of violence. Adding that Masih’s statement remained unchanged when he appeared before a local magistrate for judicial remand, the police official said the couple had been sent to prison. Rufus Solomon, minorities leader of the opposition Pakistan Tehreek-e-Insaf party, said that he had visited Gojra to inquire about the incident, as it had caused tension and raised fears among area Christians. Gojra was the site of bitter violence in 2009, when eight Christians were burned alive and at least 40 houses and a church building were set on fire by Muslim mobs following rumors that local Christians had desecrated the Quran. Lamenting that cases of persecution of minorities rise in Punjab Province whenever the Pakistan Muslim League-Nawaz is in government, Solomon called for an independent inquiry into the incident.